Hey everyone tomorrow is a special day for me. A day that should be celebrated. It is also a day that should be like every other day. Tomorrow is "Take Me Outside" day and I hope to celebrate it by doing what I love to do...by taking a trip outside and up a river somewhere. It's funny because just recently I had an opportunity to talk with some middle school boys and only 1 in 5 had spent more than 5 nights out in a tent. This shocked me. While I am aware with the "Youth Nature Deficit" I was surprised that this group I was talking to might suffer from that problem. These boys were, in general, farm boys by nature and thus it would be expected that they might be regularly exposed to such activities. Not so however. This recent talk furthered my resolve to encourage others to get outside and explore nature. From the expansive river valleys to what sits under a decaying leaf in your backyard. It all has something to explore. Get out there tomorrow. 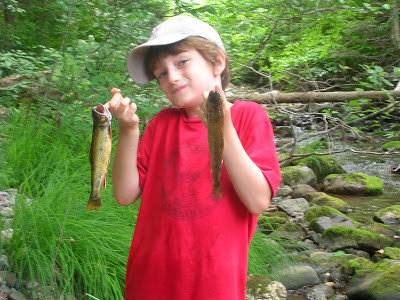 Though we won't be fishing and he is in school, his Phys Ed class will be outdoors tomorrow. Just had this published in today's Kings County Record. Hope you enjoy the read and sorry for not posting more recently but the weather has been great and I've been spending a lot of time in the woods. Fall is now in full swing and I have been driving from Sussex Corner to Alma to witness it over the last three days. It is amazing how trees in different areas have been turning at different paces. 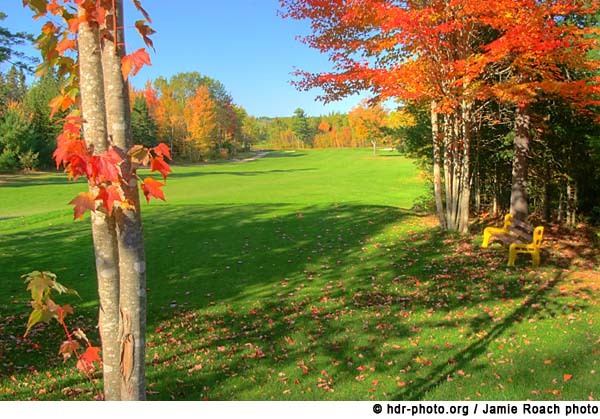 The maples as I leave the Kennebecasis valley are a crisp red and the birches and poplars are yellows. As I close in on Alma the maples are still clinging to the last remnants of green in their leaves and the birches and poplars are only slightly yellow. The drive into the sunshine and fog in the morning is challenging as I squint against the glare in the windshield. I pull the visor down just as a moose crosses the road in front of me, no doubt just happy to have made it past the previous weekend. A brown oak leaf with a purple tinge floats towards my windshield before flying over the cab of the truck. The floating leaf takes my eyes towards Wolfe Lake where I notice a loon lazily swimming on the fog shrouded surface. It was one of those mornings where everything seemed to be moving in slow motion. This is not the first time that I had felt this type of sensation and I was never able to explain it. Recently I read through a random web site that discussed an interesting study on how time slows down for people who experience a sense of "awe". It illustrated three different experiments and all had the same result. So now I have an explanation for that feeling that has now become familiar when I explore our wondrous part of the globe. That feeling of awe can often be found when exploring our natural ecosystems. To further enhance the slow down effects of "awe" in nature consider this: because you have to literally slow down to explore nature, time is in super slow motion. No doubt your heart, blood pressure and many other physical conditions will improve in this altered state. "Altered state?" This brings up another feeling I have come to know. I often feel a natural high when in nature. When I am pushing my body to its physical limits by climbing a series of tough hills it is baffling how I can smile and laugh at the end of the day. It isn't simply from the sense of accomplishment but the awe and physiological reactions to the physical activity. In the fall, for me at least, these sensations are elevated. I think this is mainly due to the colors and the rapid tempo at which the season of those colors moves on. If you're looking for a way to slow time, fall, and your mind down, you should consider attending one of the many fall events in our region. Sussex Corner is hosting a new Fall Harvest Day on October 20th and they anticipate a great celebration of local talents and food. With the Bluff as the back drop at Sullivan Park the good time should move last a long time. The Balloon Fiesta has now come and gone with a great weekend hosted by that incredible organizing committee. Even though the weather didn't cooperate all the time, when the balloons go up it is special. Below is a column I submitted to the KCR which was printed in their September 11, 2012 edition. I spend more time chatting with hikers than ATV riders but it has often frustrated me when I listened to hikers lament how bad ATVs are for trails and the environment as if all hikers were excellent for the trails and environment. I can't argue that when a hiker damages a trail it is usually less visual than an ATVs but I think if both user groups work together then both trails and the environment could benefit. I recently worked on an ATV trail project that improved both the trail and environment and I know of hiking trails that could use similar work. Feel free to let me know how you feel. Working for the KWRC, I'm putting the finishing touches on a bridge we built in partnership with the SVATV Club. The bridge will keep the bikes from crossing a small stream. The Atlantic International Balloon Fiesta is just around the corner and our household is pretty excited for all the excitement that weekend brings to this great region. Originally I was hoping to bring you a column on a great balloon ride but alas, my ride was postponed and thus I am left with a scramble to find my inspiration. Thankfully my job often provides me with many topics that are worth discussing. At present I am working at separating a recreational trail from an ephemeral stream, one that runs part of the year. The trail is used by hikers, bikers, and ATV riders. So what is inspirational about this? Is it the fact that by separating the trail from the stream I am improving the natural ecosystems while improving the trail? Is it the scenery in the remote location I am working in? In fact it comes from the fact that this trail is mainly an ATV trail but in reality it serves as a trail for many uses. Hikers and ATV riders in the province have been feuding over trail space in the recent past and I feel that more could be accomplished if the tense feelings were set aside. One of the partners on this "Trail and Aquatic Corridor Restoration Project" is the Sussex Valley ATV Club and already some of their members have worked a tough 10 man days on the project which should wrap up later this week. A log crib wall helps separate the ATV trail from the stream bed. As a hiker I understand some of the issues hikers have with the ATV riders but I feel that many are unfounded. In my mind the only viable argument is the loud noise of the bike engines. When used properly though a bike can be quiet and have little impact to the environment, especially if on a well developed and properly designed trail. A good ATV trail also makes a great hiking trail or mountain biking trail. Even better than that, a protected trail corridor could also serve as a protective corridor for watercourses or sensitive habitats. As a hiker I don't always use trails and even when I use trails, the terrain they cover wouldn't be suitable for an ATV. In fact ATV trails provide access to some of the terrain I backpack or hike across. Without the ATV trail it would mean a lot more hiking to access the area I wish to explore on foot. In a way I owe thanks to ATV trails or old logging roads for allowing me to more readily explore some wonderful stream valleys and ridges. The biggest detriment to this issue of hikers versus bikers is those who don't properly use the trail we should share. Hikers are not entirely innocent here but ATVers who abuse the trail typically have a more noticeable impact on the experience for all. There are some ecosystems ATVs should avoid, such as stream beds; except at established fording sites, beaches, and areas with plant species with special status. Hikers can more effectively access such habitats without impacting them. It is truly about the mindset of the rider or hiker that determines how much impact they might have on the environment. Maybe you have impacted the environment recently and are looking to offset that impact. If so, come out on September 22nd to the KWRC's Great Canadian Shoreline Clean Up where you can clean up litter from local river banks. Fall is definitely in the air. I sat at lunch this afternoon amidst the maple and spruce and could smell the moist mud and falling leaves. I drank a freshly made, steaming, cup of tea and relished in my surroundings. I loce fall mainly because when I'm in the field working there are few to no bugs, and the temperatures are much more bearable. As the leaves fall you are provided a different angle of the hills that lay behind the trees and you notice little, interesting, aspects of the topography. A hidden rock face, that you vow to come back and tackle, appears, where before all you could see were the lush leaves of a stream side stand of ash trees. The stream which days before was only a trickle is now a strong eroding force that carries stones and debris downward to the larger rivers. As I sat an finished my tea I couldn't help but turn my head skyward and say a brief prayer of thanks. The cycle of the seasons is a true gift that keeps us feeling refreshed and new. As fall starts to fade into winter I will likely feel the thrill of winters treats. I am blessed to work outdoors on a regular basis and I don't know if I could handle being stuck in my office all the time. Being outdoors is refreshing in itself but the changing seasons further enhance that cleansing feeling and cause me to continually smile with a child like grin. Where ever you were today I hope that you too enjoyed the day. Stacking and skipping stones is one of my favorite past times. It can easily be shared with my kids. This blog entry was originally published in the August 28th edition of the Kings County Record. I have now had more than 100 columns published there and owe them a debt of thanks for continuing to print my material. I hope they continue to do so and I hope you will consider supporting the KCR when you can. I want to send a special thanks to David Kelly who is moving from the KCR to accept another position within the newspaper industry in southern NB. 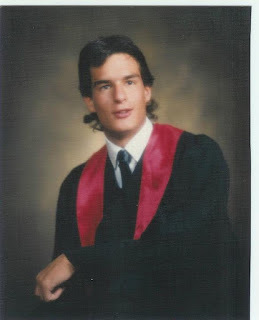 David was always available and more than flexible with my columns. Thanks Dave. I have referred to this topic many times in past articles and it speaks very highly to my affinity for water. One of my favorite past times is skipping stones and I have had this since I was a young kid. We have so many great areas to take part in this hobby that I often get a chance to practice. Not only do I skip the stones I sometimes take fun out of balancing them. Recently I had the chance to spend a rare evening with just my daughter and I took full advantage and shared my love of skipping stones with her. We started the warm August night sharing an ice cream cone and after our ice cream we drove to a parking lot that put us next to a gravel bar along Trout Creek. Now when skipping stones the location is important. The first thing you need is a great, cobble beach with lots of flat stones. Trout Creek, Grand Lake, and the Bay of Fundy Beaches are some of my favorite places to skip rocks. The next thing to look for is a place where the water is flat and smooth. Skipping rocks on wavy or fast flowing water is a challenge and requires good timing and aim just to get the first skip in. Flat or wavy, it doesn't matter, skipping rocks is a great way to kill time and get some exercise. On flat water, with a light to modestly weighted, flat stone, and a modest throwing arm, you can get more than 20 consecutive skips. Our location on Trout Creek offered a long stretch of flat, slow running, water where I could throw rocks upstream. The upstream approach helps get more skips and I was easily getting 15-20 jumps from the good stones. The cool ripple effects are cool to watch but for my daughter she simply liked the splash the rocks made. She struggled to throw the rocks let alone skip them but we were having fun simply being on the water. I decided to change it up and showed her a target close by and we tossed stones at it and she was excited when her rock made the water and more so when she finally hit the nearby target. After my arm tired out we searched for "cool" stones. My idea of cool was a bit more sophisticated than my daughters but the joy she took out of finding different colored and shaped stones was entertaining. She put a couple of pounds of stones in her pocket to add to what she called her "Snows collection." Me, I pretended to put them in pocket only to take them out later when she wasn't watching. After I got tired of walking we sat on the gravelly bar and as we chatted I built her some rock towers to know over. Building a tower out of rocks is not as simple as it might seem. You need to consider how the rock is shaped and how it might sit on the rocks you already have in place. A rough surface rock is easier to balance than a smooth surface as it doesn't slide around as easy. The only down side of this evening was that darkness came way too quickly. As we left the gravel bar we picked up a number of pieces of trash on the way out. It was a great night ending with our good deed for the day. 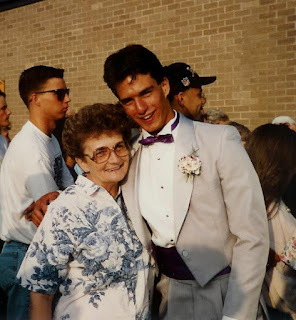 Through past experiences that led to other columns I often have come to realize how I am aging. One sport that I recently thought I'd like to try again is golf. As a kid I spent my summers at one of three locations; the ball field, a good fishing hole, or on the golf course. Once I had to start paying intermediate membership rates however, my golfing heavily decreased. The majority of golf I play now is on the computer that I use to write my columns. On the online World Golf Tour, I play as a pro with a 6 handicap but hardly burn a calorie through 18 holes. Even with the online opportunity I still only play maybe 3 rounds a month, after all my lap top is for writing not playing. A little over a week ago I was able to take part in a one day golf social as part of the local Chamber of Commerce tournament. I was a bit nervous heading into the day as I was scared I would not be able to reach my own expectations or those of my own teammates. The tournament was a four ball scramble which means we take the best ball for each shot with some exceptions. My biggest fear was that we wouldn't want to ever play my ball. Luckily my golf game was not as rusty as I thought it might be. I struggled through the first two holes but my drive on the third hole was long enough that we used it for our first shot on the hole. My next shot was terrible however as I shanked a five wood. Golf is frustrating that way but when you hit a sweet shot you are hooked once again. It is an up and down relationship for a player like me and it is that roller coaster and the challenge of keeping my emotions in check that has always got my competitive juices flowing. Despite my online WGT ranking, I'm no where near a pro so I can't give anyone tips on golf. I can say that it is a game that everyone should try because you don't have to be good to enjoy the walk. In the Sussex area we are blessed with many courses and each has its selling features and no doubt everyone can find a course they enjoy, even if it is just for the walk. Walking is the greatest exercise and after carrying your clubs and walking 18 holes you'll believe it. After my first 18 holes of 2012 I know I sure could feel it. 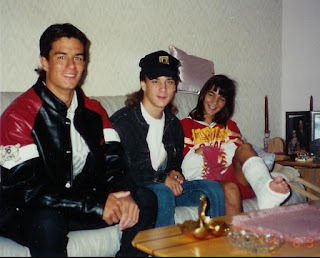 My right wrist ached, my back was as tight as a drum, and I was exhausted, and we had taken a cart. If I recall, I always played better when I walked than when I played out of a golf cart. The reason for this was that I could stay more relaxed when I walked. I could let my mind wander away from golf for a bit and take the competition out of it. The biggest competition in golf for me was myself and when I relax I play better. I encourage everyone to get out on your favorite course and relax. Looking over the Fundy Coast from Martin Head shows how many beaches could exist here. This is my last look at my spring 2012 hike across the Fundy Footpath with 3 generations of the Whalen clan who I introduced in the first hike entry - The Hikers. It was a great trip and one that will be remembered for many years. The parks, the tidal flats, and the waterfalls, are all notable on a global scale. For me though, the best thing about the Fundy Footpath is it's beaches. 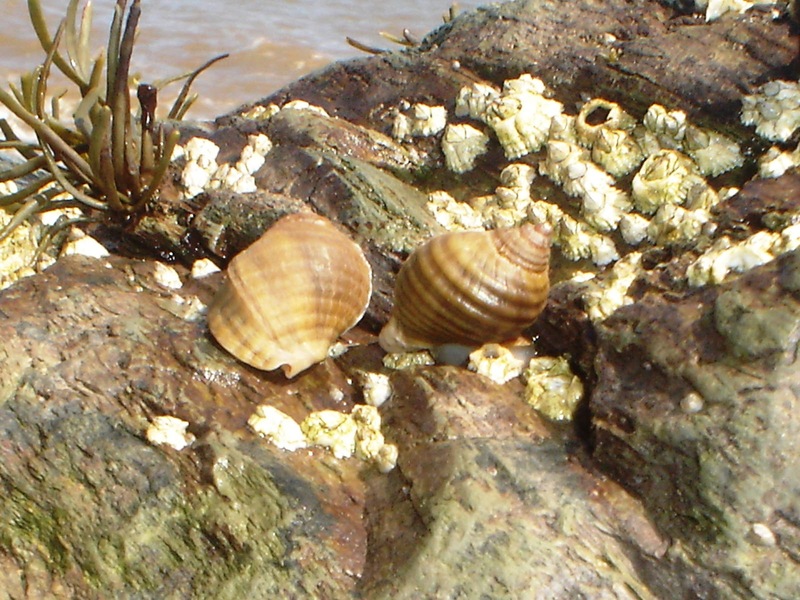 The beaches are full of a variety of tidal life. When most people think about beaches they think about warm glistening water and long ribbons of white sand but, typical of the FFP, in this wilderness the beaches are even rugged. The tides are the highest in world and so the beach changes dramatically every six hours. With the constant flow of the Bay of Fundy the water never gets that warm and even during a hot day in July it takes thick skin to be able to swim. If you could stand the water temperature, in order to get to the water you typically have to navigate over large boulders to get there. Just about every time the FFP crosses a river it comes to the mouth of the Bay to do so. Each time, the hiker is rewarded with the sound of crashing waves on rocky beaches. Wolfe Brook and Telegraph Brook each have a steeply sloped, boulder covered beach, where wave watching is an awesome experience, especially on windy days. At high tide along these beaches you are hemmed in close to the shore and it is hard to find a spot where ocean spray can't find you, but during low tide, you can explore the rock faces and smooth boulders. Regardless of where the tide is on its cycle, both of these small, unconventional beaches offer something to see and explore. If your into collecting stones, skipping stones, or as one acquaintance of mine does, balancing them, these beaches (as most FFP beaches) are a stone lovers dream. If you like scrambling and playing on boulders these beaches are great during low tide as you can find crevices, caves, are passages that are fun to play around. I like all of this stuff but what I truly love is finding that low lying boulder that has the right slant and smoothness that I can comfortably lean back into it and use it as a chair to watch the waves crash in. Wolfe Brook has lots of rock and boulders to explore. The beach at Martin Head is one of the most iconic locations on the FFP. It is a long beach that resembles the more typical image of a beach, especially at high tide. The long isthmus that forms the "Head" is very gravelly with well rounded and weathered rocks. The Quiddy River delta is a mud sliders paradise and is full of thick, slippery, mud. For those who like to build sand castles, there is lots of sand too. There is no poor time of year to explore this beach but on long weekends through the summer it can be busy with off-road vehicles who like to use the beach as a camping area. Why wouldn't they? It's a beautiful spot to watch the tides and soak up the sun. With the history of this place exposed at a number of locations it is easy to get lost here. Your mind drifts over not just the scenes in front of you but also through those you can imagine from years gone by. Martin Head can be viewed from a variety of angles, none of which are bad. A beach similar to Martin Head would be Long Beach. As it's name implies this is a long beach. Small airplanes have been known to land here. There is history here as well, although not as obvious as Martin Head, it can be seen if you know where to look. At high tide this beach is a long ribbon along the shore where in places it is impassable while at low tide there is an unimaginably wide beach over 2km in length. The highlights here change after every storm as new drift wood floats in and old rocks are covered over. It is worth exploring over and over again. Seeley Beach seems to enhance everything, including fog banks. How cool is that? The last beach is probably my favorite. I try to camp here whenever I can and I have never had a bad night. Even when the weather is poor, it is like the old saying a bad day at Seeley Beach is better than a great day at work. On a rainy day the sun seems to glisten off the millions of rocks and make it sparkle like the jewel it is. The topography of the beach extends it out into the Bay more than other beaches so you can look north up the Bay over all the ground you have or will hike over if you're hiking the FFP. If you place your tent right and conditions are perfect, you can watch the best sunrise in the morning while you can count the Nova Scotia lighthouses in the evenings. I watched lighting one minute here, double rainbows, and storms move up the Bay. As I finish this entry up I think about other aspects of the FFP and I've decided that I'll add an entry of photos with captions at a later date. I hope that these entries have peaked your curiosity and you'll get out there and experience some of the locations I have wrote about on your own. Happy trails. Laying in the grass looking up at the clouds as the sun set. There is something that I can never remember doing as a kid that I wanted to do. I had lots of opportunity as a kid to pursue this adventure but just never made the time. In fact I never much gave it much thought until I was too old to truly enjoy it and not being embarrassed if I was caught doing it. Well here a few nights ago I had my dog Bambi out in the field behind the house doing her last deed of the evening and suddenly I noticed the tell tale sign of fireflies every where. There were tiny flicks of light just above the tall grass that provided a small and silent light show. I sat in thought about these tiny bugs and debated waking the kids right then and there for a firefly catching extavaganza but thought better of it. I'd wait until the weekend. SHHH! Daddy be very quiet we're hunting fireflies. So last night the kids and my wife and I all lathered up in fly dope and headed to the field to see if we could catch some fireflies. It was an adventure for the kids and the dog who bounded through every inch of the field and made it very difficult to catch our bug of choice. As the sun set and darkness fell the kids watched as more and more fireflies started lighting up. After a great deal of effort we managed to catch one firefly for each of the kids. We also caught moths, mosquitoes, and slugs which our daughter really seemed taken by. At the end of the evening, well past the kids bedtime, we let all the bugs go safely back into the field. Hey! Where did the dog go? Has anyone seen...hey where is everyone? It was a memory making moment and one I wish I had of made time for when I was a young kid. I hope my kids look back on it and laugh. I know I will. Mike crosses the top of one of the falls located east of Seeley Beach. This is the fourth in a series of blogs on my recent trip across the Fundy Footpath. The first entry was about the hikers. The second entry was about the Parks and I held back nothing on my dislike of the way the Fundy Trail Parkway is being developed. The previous entry was about how much I enjoy the mud flats along this undervalued coastal trail. I have been attempting to describe the iconic features of this jewel studded, 50km hike, and the next icon I want to showcase are the numerous waterfalls. I am likely to leave a couple out but there are so many that I couldn't possibly include them all. To be included here I evaluated on a personal level whether the waterfalls would be considered iconic or not by others. Certain locations speak to people more than others so if I leave a waterfall out, I encourage you to still try to get out there and witness it and see what it has to say to you. A small set of falls inside FNP is worth checking out. 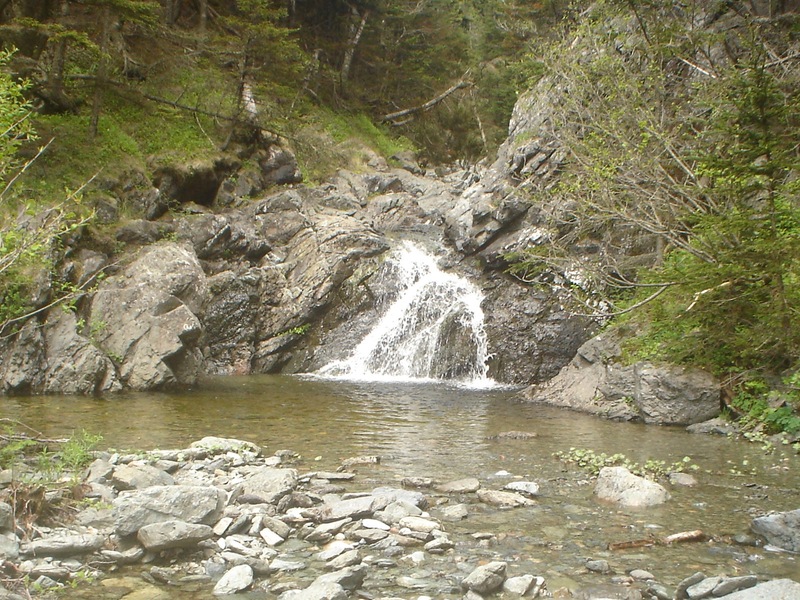 Our hike would take us east to west and the first waterfall we would encounter is found a bit off the beaten path inside Fundy National Park. Since it is in the Park you need to tread lightly to get there. To be honest the only reason I know it is there is because on a previous hike I needed to take a pee break and wandered into the woods below where people were filling water bottles. On that previous hike, I didn't go down to the falls but I could hear them, and this time they were still beaconing me. These falls likely vary in size depending on the amount of rain or snow melt that is feeding them. On this hike they were a modest falls where the water had sculpted the dark conglomerate rock into two steps before scurrying off towards the Bay of Fundy through a steep, forested, gully, green with mosses and ferns. What makes these falls iconic to me is the fact that very few people know they are there and they are unnamed (as far as I can tell.) To me this makes them more valuable and thus iconic. After leaving the park you cross a number of steep valleys and small ravines. No doubt every one of them has a small waterfall or chute and I struggle not to clamber up each little water course in an effort to maintain the loose schedule that we have set. Unfortunately, we all need to return to a hectic life based on needs and wants after the weekend. The next set of falls though removes all thoughts of that life. Tweedle Dee Tweedle Dum Falls is a large set of falls and can cause even the most negative among us to smile and raise his voice an octave higher as we share our thoughts on this great wilderness we are so privileged to take in and enjoy. The modest pool at the bottom of these falls are irresistible and you have to wade in and have your picture taken. Once done there your curiosity will compel you to climb to the top and explore further. Tweedle Dee Tweedle Dum Falls is a short hike off the main Fundy Footpath but well worth the hike. There is nearby camping that makes this an iconic location on the Footpath. The falls at the mouth of Telegraph Brook have eroded down over time but are still impressive. The next stop on the waterfall tour is slightly less voluminous but no less impressive. Maybe what is so iconic about these falls is the fact that they sit right at the mouth of the brook. It is imaginable that in recent geologic times that the falls used to fall directly into the Bay of Fundy. Now the plunge pool is separated from the Bay by a boulder and cobble berm. Telegraph Brook has a small campsite right next to the pool at the bottom of these falls and with a tent pitched there it is the iconic image of the Fundy Footpath. The small Telegraph Brook contains a number of falls and chutes above this final falls but to explore this Brook is difficult as it is a very narrow and treachourous ravine. 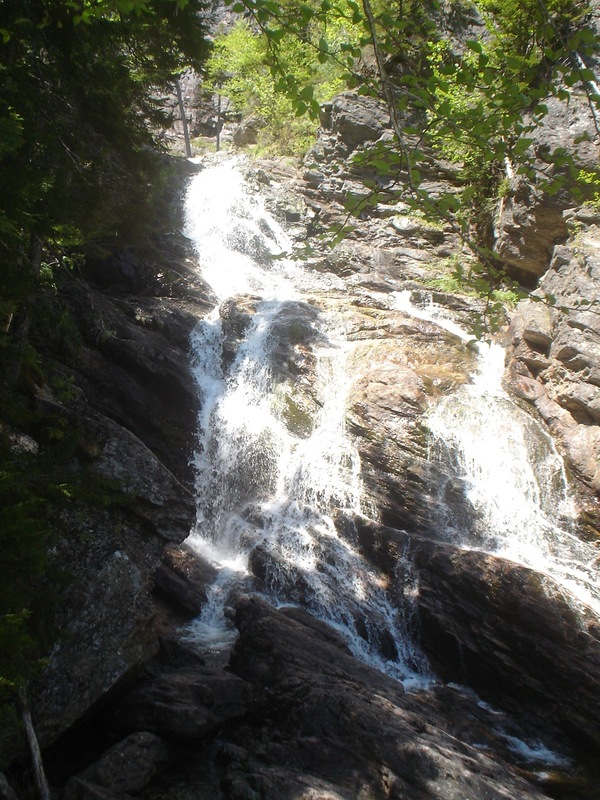 The unnamed falls along the true right bank of Wolfe Brook. For me one of the cool things about waterfalls is the fact that they may not always be flowing. When you find these running it's like hitting the jackpot. As we continued east on the FFP we were blessed to see water flowing over the high rock face that greeted us as we crossed Wolfe Brook. On past hikes I have seen this fall completely dry while on others I have seen it with much more water. Maybe the interesting aspect of this waterfall is as you continue the hike, you make a challenging climb to the top of the small unnamed stream that provides it with its fuel of force. The green mosses, lichen, and ferns indicate the boggy area where a small spring bursts from the ground during wet times to feed the waterfall. As icons go there are few along the Fundy Coast Wilderness area that compare to Walton Glen Canyon and the associated falls. Although they are not on the FFP, they are worth taking the time to see. Approximately a 2 hour hike from the Dustin Brook campsite these impressive falls are made all the more impressive because of the wilderness you need to traverse to get there. The Eye of the Needle and Walton Glen Canyon are narrow slots with large rock faces all around. A hiker spends more time looking up instead of down which in this location can be dangerous. The Walton Glen Falls as photographed during a 2009 trip. There are many more falls but these are some of the best. Below are some pics of other falls along the hike. Note the shadows on some of the photos and how they change the mood of each of the locations. The Bay of Fundy is known for its high tides. In fact it has the highest tides in the world and during the spring months they are at their highest. At the upper end of the Bay they can reach a height of 16m. As the water recedes each time it leaves a number of large tidal mud flats and during our hike along the Fundy Footpath we were required to cross three of them. Each has its own challenge and rewards and the reward is always more than worth any challenge. I would even say the challenges are rewarding. The first mud flat is likely the most challenging and illustrates the height of the tide really well. 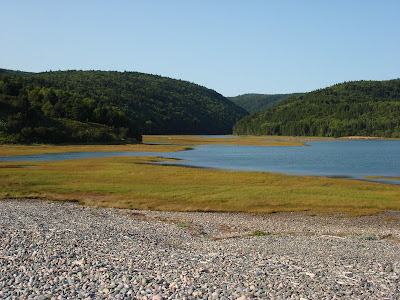 Goose River, at the western boundary of Fundy National Park, has a narrow valley where Goose River and a small tributary come together before entering the Bay of Fundy. This means that we would cross two watercourses before getting on our way. The mud here is deep and you can easily loose your footwear as my sister learned the hard way. As we made our way along the river bank we had to watch the sharp shale bedrock that was exposed all the way around the crossing. 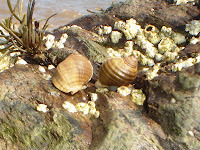 As we neared the top of the mudflat we looked back and absorbed the scenery and were amazed by how low the tide now was. Not an hour earlier, as we ate lunch on the beach that contained the tidal flat from the Bay, the water was much deeper. We crossed the river a final time above tide line and above where an old dam was once located. I snapped a picture of a butterfly that was flitting among the boulders and grasses along the shore. This was the official start of the Fundy Footpath and we were no longer in Fundy National Park. Looking up along the shore of tributary to Goose River just before we crossed. We had to hike approximately 5km in order to reach our next tidal flat crossing and we had to do it in less than 3hours in order to avoid having to cross way up stream above the trail. Where the mud at Goose River is the problem, the issue at Goose Creek is the length and the water temperature. I have found that, no matter what time of year you make this crossing, the water is always numbing cold. As you approach the 3/4 mark of the crossing you can no longer feel your toes. When you make it across the flat you sadly realize that you still have to wade through deep grasses that grow along the many spring fed streams before you get to the campsite you so long for. The cold springs move the numbness from your feet clear to your hips it seems. Once we cleared the tidal flat we made camp at the Goose Creek campsite and in short time we all donned dry socks. From time to time we checked to see how much water had flowed over the flats we had not long ago crossed. For those of us who hadn't seen it before it was likely surprising to see how much water filled the river valley. The cap of Martin Head beyond the cold mud flats of Goose Creek as seen in a trip in 2009..
From Goose Creek you can actually see the next tidal flat we would be challenged by. The scenic Martin Head isthmus is an iconic location and I will likely discuss it in a later post. From Goose Creek we would spend our morning heading towards it through the wooded trail. Before getting to the road we make a trail down to the long sandy beach for an early lunch as we wait for the tide to recede far enough to cross the mud flats and gravel of Quiddy River. The muddy portion of this crossing is much shorter than the others but that does depend on where you cross. There are mud flats at Martin Head that are great to play in and explore. In some places there are strong indications of the settlements of years gone by and the mud flats no doubt hide much more. 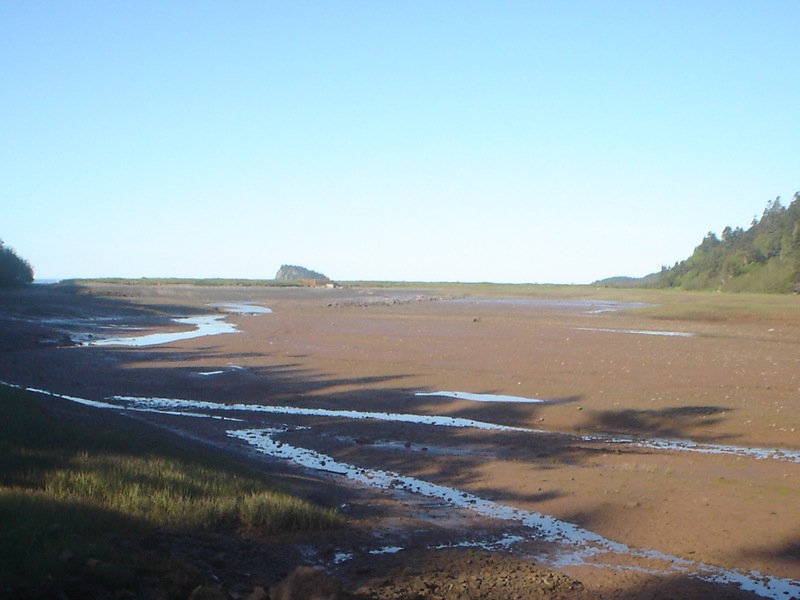 The mud flats at Martin Head are covered by water in this 2007 photo. Luckily we crossed a much narrower section. The mud flats are just one of the great iconic features of the Fundy Footpath and I hope you continue to watch for future posts on this great hike. I will continue to describe the iconic features of the FFP while providing you with a look into my personal views of this great wilderness area. 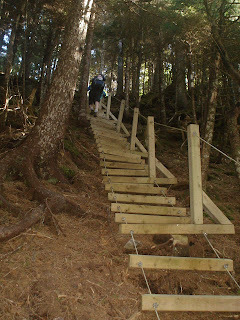 If you want to help with this great trail you can check out the Friends of the Fundy Footpaths or the Footpath website. 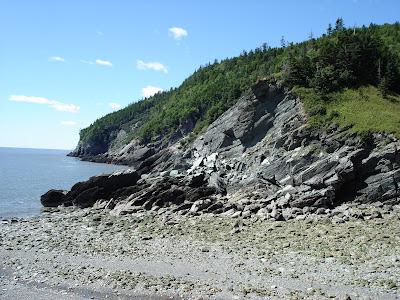 This is the second in a series of blog entries on my hike across the Fundy Footpath in the spring of 2012. The first entry about the hikers, introduced you to the people I was hiking with. 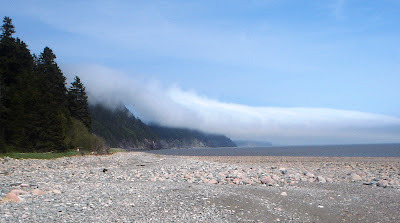 This entry will tell you a bit about where our hike started - Fundy National Park. and ended - Fundy Trail Parkway. This small stream is one of many along the section of trail in Fundy National Park. 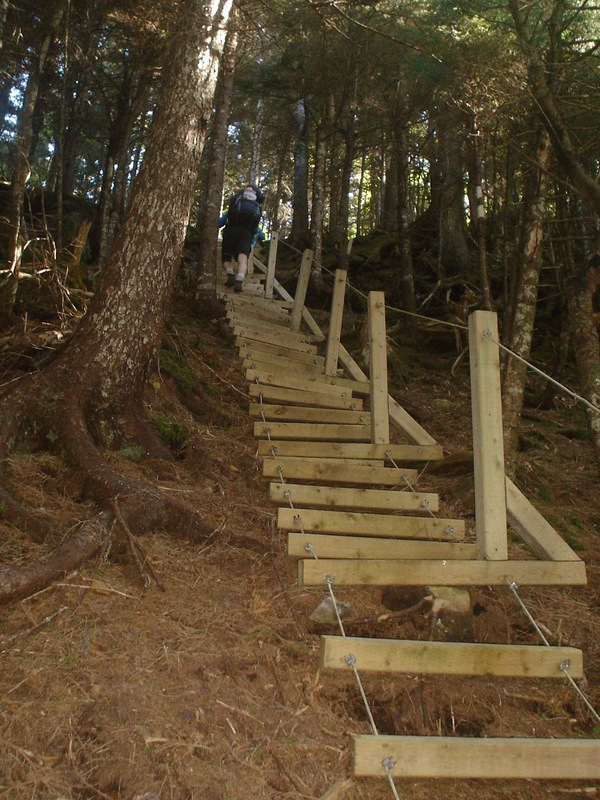 The Fundy Footpath is a grueling exercise that tests a person's resolve and determination. Our plan was to move from east to west. We would start in Fundy National Park (FNP) and hike towards the Fundy Trail Parkway (FTP) while covering 50km of steep coastal ravines and forests. I prefer to hike the trail this way as I find it more rewarding to end at the Big Salmon River. The 8km of hiking inside FNP is along old logging roads and while it is scenic, the road walking makes it seem anti-climatic when you end there. Every hike needs a beginning though, and the Park would be ours for this years rendition of adventure on the Footpath. The hikers were dropped off at the Pointe Wolfe parking lot at the southwest corner of FNP on a cool but sunny Friday morning. Everyone was in good spirits and wore tired smiles as the night before likely was restless with excitement and anxiety. Adrenaline and enthusiasm would carry us through our first day in which we would hike 17km to Goose Creek. 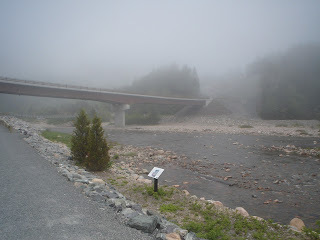 The red covered bridge we drove over to cross the Pointe Wolfe River was just an indication of what lay before us. Lately there has been a great deal of debate over the roles National Parks play. Some feel they should serve as a showcase for our nation's natural beauty while others feel they should act as a sanctuary that protects natural habitats and beauty. Depending on how you frame your opinion, it may hinder how you view Fundy. 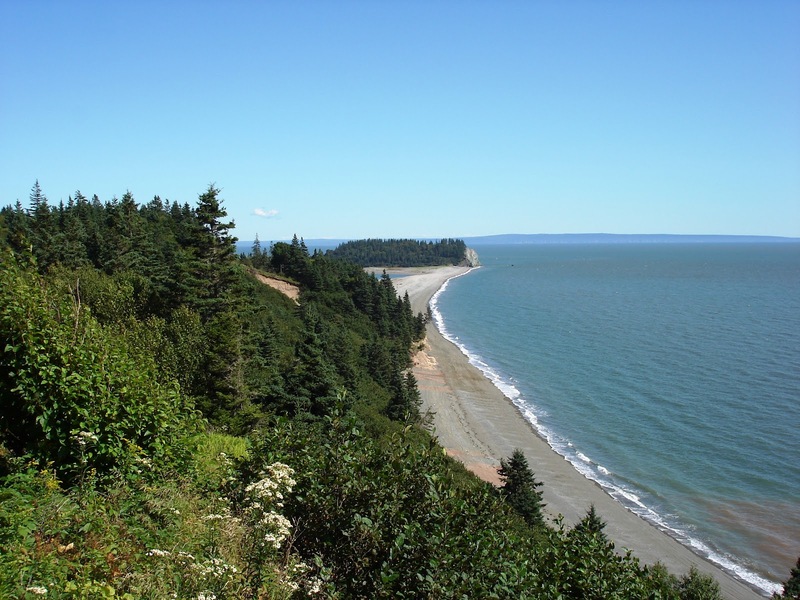 As a relatively small park, Fundy has little infrastructure, outside the golf course, so if a urbanized, full service escape is what you are looking for, Fundy is not likely your destination of choice. It is for that reason though, a frequent destination of mine. I hope that, as more and more Parks are moving towards high end, service oriented, tourism development, Fundy can resist that demand. As I mentioned earlier, the hike in the Park is along an old logging road, but the end is a spectacular beach surrounded by tidal mud flats and steep valleys. Goose River acts as the western boundary of Fundy National Park and this could be unfortunate as the entire River deserves protection. As we leave Fundy we play the "In Fundy, Outta Fundy Game near the signs marking the Park border. The next Park we encounter is the linear Fundy Trail Parkway. A number of years ago some people thought it would be a great idea to promote the Fundy coast here as an undeveloped coastline by developing it. It is unlikely that the tax payers of New Brunswick truly know, or understand maybe, what they are paying for in regards to the Fundy Trail Parkway. The road is built over steep valleys that are prone to drastically changing weather conditions not just seasonally but daily. The steep valleys create high volumes of runoff when the weather brings rain or snow, and when you put a road in a steep location such as the area around Big Salmon River, controlling run off, and maintaining roads becomes a large undertaking. Unforunately some of this has resulted in the development of large washouts along small streams and Long Beach Creek. In many places you can see where the FFP has been impacted and become impassable due to this washing and slumping. I don't place all the blame on the development of the Parkway as some has to be attributed to more intense rainfalls by nature lately, but I still don't agree with the manner in which the FTP was developed. I think New Brunswickers, especially those who love nature and wild spaces should be upset that their tax dollars are being spent on creating this environmental degradation and more so that we will continue to pay for it as it will likely never pay for itself. The next entry will be more cheerful and showcase the beauty of the FFP. I promise. I just really needed to let people know again about the threats to the FFP in the name of tourism. In my mind we would have been much better off to promote more backpacking and wilderness excursions to the area.